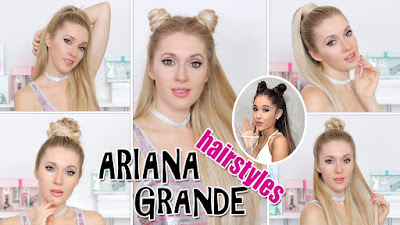 Lilith Moon: Ariana Grande hair tutorial: TOP 5 hairstyles in 2-5 minutes! Ariana Grande hair tutorial: TOP 5 hairstyles in 2-5 minutes! In this video I'm wearing brown contact lens: Misaki Natsumi Brown. i am so happy to share this testimony with the world because generally there are so many doubts about the cure of hpv and cancer This is real take it serious, i am so happy that today i can give this testimony to the world and also help in saving life of people who has been condemned for death just as i was ,who will believe that herbs can cure hpv and cancer completely from the body, i never believe that this will work, i have spend a lot of money getting drugs from the hospital to keep me healthy, it got to a time that all i was waiting for is death to come because i was broke and i already have strong outbreaks from the hpv, one day i was going through the internet asking questions online just to know more about the latest development in the medical sector to see if there is still hope then i stumbled on a post about about this great man called Dr. Ehiagwina through a publicly made a testimony on how she was also cured of ALS by this herbal doctor who is well known for his strong ancient herbal practice at first i doubted both the woman and the doctor just as so many that see's this post would doubt because medically it has been proven impossible but later i decided to give him a try so i emailed him I did not believe him that much, I just wanted to give him a try, he replied my mail and Needed some Information about me, then I sent them to him, he prepare herbal medicine and sent it through Courier Service for delivery, he gave my details to the Courier Office. they told me that 3-5 days I will receive the package and after receiving it, i took the medicine as prescribed by him at the end of 13days that the medicine lasted, he told me to go to the hospital for a test, and i went, surprisingly after the test the doctor confirm me hpv negative and cancer disappear i thought it was a joke, i went to other hospitals and was also negative the doctors were speechless and i said it was a miracle, thank you sir for saving my life even if you cannot see this post i shall never stop testifying the impact you made in my life by restoring back my life when i was being stigmatized and even avoided by family and friends , I promise I will always testify of your good works. Dr. Ehiagwina contact: ehiagwinaherbalhome@gmail.com OR call +2348162084504 you can also add him on whatsapp. All these picture and videos are amazing and i really like all these hairstyles that you have shared in this blog post. Edinea Beauty Salon offer hair services In Coral Springs from cuts to hair coloring. Their professional and highly skilled staff stays updated with the latest trends in hair styling. At last, Designing your very own hair style can be the most ideal approach to get a complimenting hair style that works for your hair and skin tones. Here are 4 simple advances that you can take to plan your very own look. how to get a huge knot out of hair Really appreciate you sharing this post.Thanks Again. Fantastic.